This is a series on some of the medication that I’ve collated from parents who shared in forums. 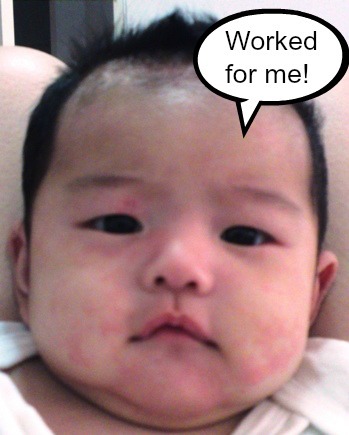 For this week on Prednisolone, my baby with eczema had been prescribed a one-time 3 week reducing dosage course at about 7 month old, and it had cleared her eczema which then became manageable after the course. I know of many other young children, who did not respond well after the course, and some who did – please freely share your experience in the comments, your sharing can help encourage and comfort another parent. Prednisolone is a type of corticosteroid which is prescribed to control inflammatory and allergic conditions like eczema, severe psoriasis and severe seborrheic dermatitis, colitis, asthma and rheumatoid arthritis. It works by stopping the release of chemicals that cause inflammation. Prednisolone is also used to treat blood cancer and lymphoma, to reduce the destruction of platelets by the body’s immune system. It is usually an oral prescription (for my girl, it was solution) that must be complied strictly. Self-altering the dosage is not acceptable as the dosage is decided by a skilled physician, taking into account a combination of factors such as the skin condition and weight. If you are in a highly stressed season in life, do let your doctor know as that is a factor for deciding on the dosage. From personal experience, the skin of the baby changes during the course – it may get better than worse, for my child, better again. Terminating halfway on your own, due to fear of oral steroid or deterioration of eczema, will make it more difficult for the doctor to make an assessment of how the course worked (or not). Monitor your child’s growth and if concerned, discuss with the doctor. Steroid course may slow a child’s growth if used over long period or cause thinning of bones (osteoporosis), as it impairs calcium absorption and new bone formation. Look out also for signs of vision changes. There are interactions with other medications so it’s best to let your doctor know of medication, vitamins and supplements that you or your baby/child is taking. Taking steroid over a long period can lower the body’s immunity. Avoid contact with people who are ill (esp. with chicken pox, measles or shingles), and also those who have taken a recent live vaccine (also check with the doctor before your child gets vaccinated). Wash hands also to prevent infection. Watch for side effects, one of which is adrenal issue whose symptoms are fainting, irregular heartbeat, thirst, irritability or unusual fatigue. Click here for a list of common to less seen symptoms. There is no particular diet to follow (except avoid liquorice), unless directed by your doctor. Most Importantly, Does it Work? I’ve found a study of 21 patients, only 1 achieved stable remission of eczema versus a higher rate (6 out of 17) for those prescribed cyclosporine. I find it strange though that I couldn’t find more study on Pubmed for prednisolone than for other medications in this series, which are licensed for use later. I’m glad that oral steroid course worked for my child, and love to know how it worked out for you. I used prednisone for 3 weeks. My child had a bad cough and cold and 2 days after the treatment stopped it is worse than ever. Sorry to hear that.. hope it is better now. Did you get prescribed prednisone for eczema? or your child? We had to rush my LO to whitecross, because she had an allergic reaction to egg, she also happen to have discoid eczema. They gave her a dose of predisolone solution and the following day, all the eczema rashes on her body started fading and 2 days later it was all gone. Hopefully it will stay the same as it is now. Thanks for sharing, and hope it would stay that way. Take care and hugs! Testing as friend commented couldn’t post!